When combined with choppy, short layers, there’s something ethereal about deep burgundy / maroon hair color. We adore the way the model pairs dramatic, dark eye shadows together with her dramatic, dark new hair! 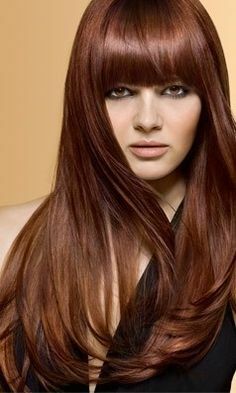 To get an much more daring look, have your bangs cut so that they will lay above your head in the side swept fashion to best show off your brand new burgundy hair.